William Hill plc. founded back in 1934 at a time when gambling was higly forbidden in Britain, got to be one of the largest bookmakers in UK. As all great companies that started many, many years ago, William Hill changed many times. It changed oweners and had ups and downs, financial changes, but always managed to grow bigger. It is listed on the London Stock Exchange and is a constituent of the FTSE 250 Index. It has over 16.000 employees worldwide, mainly in UK, Ireland and Gibraltar, with over 2.300 licensed betting shops. Other than its online sportsbook operations, the company offers online casino games, ‘skill games’, online bingo and online poker. In 2012, William Hill exapanded also in the U.S.A., in the state of Nevada, being the only U.S. state that allows legal gambling and in 2013 they`ve took they`re name to Australia, purchasing three big Australian brands, such as SportingBet, Centrebet and Tom Waterhouse and later rebranded as William Hill Australia in 2015. They are currently serving over 3.000.000 active customers. all minors under the age of 18 are unable to access any gambling activities conducted on the company`s betting website. all bets are treated fairly and all acts taken by the company are fair and transparent. any customer developing a gambling problem is assisted and guided best as possible. They offer Customer Support 24/7/365 via live-chat, e-mail, national and international phone support, entry-form on their official website or regular posts and even fax. All this in several languages, depending on the customer needs. They have very quick answers and solutions and their staff is well prepared and very helpful. The phone number for UK is 0800 085 6296 and is free of charge, for International calls you must dial +800 3551 3551 and from outside of the UK is +44 (0)870 600 0479 and it`s not free of charge. All calls are recorded for training and monitoring purposes. Deposits and Withdrawals can be made with the following debit/credit cards: Skrill (Moneybookers), PayPal, Neteller, CashDirect, Ukash, Entropay, Click2Pay, ClickandBuy, Paysafecard, Local Bank Transfer, WebMoney, UseMyFunds, Przelewy24, Sofortuberweisung, Giropay, Nordea, Abaqoos, iDEAL, Moneta.ru, INSTADEBIT, POLi, Euteller, Speedcard, Fundsend, eKonto, Boleto Bancario, eWire, Eps, Multibanco, Linea Abierta, BankLink, Teleingreso, Instant Bank, Mistercash, eCard, Neosurf, Bank Wire and Personal Cheque. All deposits are free of charge and instant, except Bank Wire, Cheque and Postal orders. The withdrawals can operated with major credit/debit cards with a time scale of 3-5 days, Entropay 3-5 days, Cheque operations take from 7 up to 10 days, while Paypal, Skrill, Instadebit, ClickandBuy only 1 day and CashDirect and Neteller operate instantly, with the mention that the time scales are estimated and not guaranteed, depending on the processing time of your own bank. 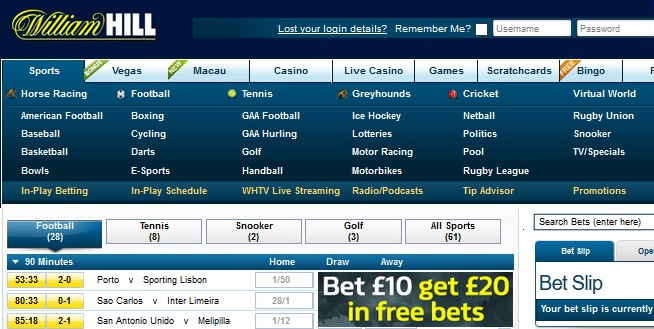 The betting markets offered online by William Hill are: american football, athletics, baseball, basketball, bowls, boxing, cricket, cycling, darts, football, GAA football, GAA hurling, golf, greyhounds, handball, horse racing, ice hockey, motor racing, motorbike racing, pool, rugby league, rugby union, snooker, UFC and volleyball, also offer special sections for important events, with the Olympics currently having a dedicated section for that. With the Betting Coverage and Odds, similar to other betting companies, their betting margins are not the greatest, but they have acceptable odds for the major leagues in three different formats, such as: UK, Decimal (European style) and American (US style) . William Hill became very appreciated over the time for their offering interesting special bets in football or tennis and rarely making mistakes when offering odds, the only inconvenient being the fact that they don`t change their odds frequently, lowering their information quality. William Hill offers live-streaming and in-play services giving the customers the possibility to watch live sports and hundreds of events as taking place, such as football, tennis, snooker and other, being especially usefull fro the horse racing, as they are one of the few companies that have a live-streaming service for that particular type of events. They provide also a radio service and mobile betting service, a radio where the customers can listen to live comments and previews or reviews on daily UK and Irish Horse Racing, shops and In-Play, weekdays from 2-10 p.m. The Mobile Betting is highly useful, allowing the clients to use their phones to do just about everything they do on their P.C. at home, including in-play betting and secured money operations, both deposits and withdrawals. The mobile application, offers the possibility to see latest scores in all sports in real time, without having to take any risks when placing a bet. Football Acca insurance where you have to place a football accumulator (6 teams or more) and if only one team fails, they will refund your stake as a free bet, up to a maximum £25. Cash in my bet: Gives the opportunity to settle a bet at the value displayed if the bet is still running and betting is still available on every unsettled selection. Bore draw: If a match of your choosing, finishes by a 0-0 draw, they will refund your money and place double bet on that specific match as a free bet. Best Odds Guaranteed (Horse Racing and Greyhounds) – William Hill guarantees to have the best odds of any online bookmaker, if contrary, they’ll pay the difference as long as you prove having spotted a better price than the one they practice. Free £25 bonus for new customers, can be claimed by creating a new account on their official website and during the registration process the new client has to enter the promo code F25, this way, when the customer places his first bet with a minimum £5 deposit he will receive a free bet with the same value of his first bet up to a maximum of £25. The clients first bet must be placed on a selection(s) with single/cumulative odds greater than 1/5 (@1.20). There are no rollover requirements! If he registers without entering the promo code, he will not be awarded any free bet. More details can be found on the official website of William Hill plc. If your first deposit equals £35 you have the chance to enjoy the 100% deposit match bonus up to £150. To obtain these £150 you must respect the 20x wagering requirement, that means your deposit is added to the bonus and multiplied by 20. To get it, you have to do the wagering requirement within 30 days, otherwise you will lose the right to cash it out. Go to William Hill Casino software client and click “Claim Bonus” and that`s it! Enjoy! There`s still the William hill Casino high Roller £300 free Bonus which applies only to customers who make deposits equal or higher than £1000. This bonus doesn`t apply a wagering requirement, you just have to make the minimum deposit and you get your £300 bonus. The same procedure as for the bonus above, to get it. First of all you should know that William Hill offers a free high quality software suitable for Windows and PC, available 24/7 and safe to use wherever and whenever you please. The software is always improved and adjusted according to the players suggestions or needs. For new players, William Hill offers €500 paid weekly joining the weekly cash tables Rookie Races, played every Tuesday to Sunday and as more hands you play the higher you get on the leaderboard and more you win. On the other hand there`s Hill`s Welcome bonus of €20 daily at 11:00 a.m. or at 7:30 p.m. and also the Sit&Go offer that gives you the opportunity to build up your bankroll fast.